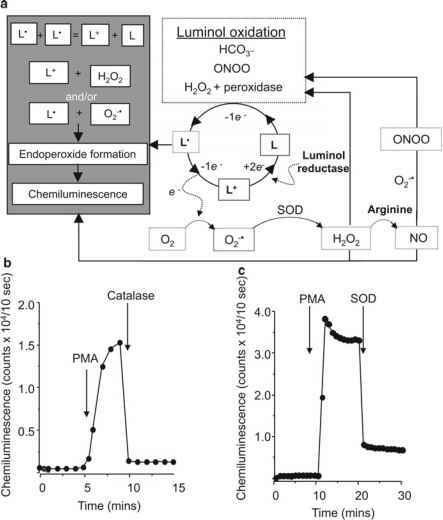 It has been presumed that both H2O2 and O.- are involved in luminol-dependent chemiluminescence because both catalase and superoxide dismutase (SOD) can disrupt the signal with great efficiency (Fig. 14.4a-c). The luminol signal generated by human spermatozoa is initiated by a one-electron oxidative event mediated by H2O2 and either endogenous peroxidase [32-34] or, in order to sensitize the assay for extracellular H2O2, by the addition of horse radish peroxidase to the medium [32, 35]. The one-electron oxidation of luminol leads to the creation of a radical species (L2). The latter interacts with ground state oxygen to produce O2- that then participates in the oxygenation of L2 to create an unstable endoperoxide, which breaks down with the release of light (Fig. 14.4a). According to this scheme, O.- is an essential intermediate in the manifestation of luminol-dependent chemilumines-cence and it is for this reason that SOD is such an effective inhibitor of this probe. However, the biochemical activity of SOD should never be taken to indicate the primary production of O2- by human spermatozoa, as sometimes suggested; O2- is simply an artificially created intermediate that is essential for luminol-dependent chemiluminescence . Indeed, any univalent oxidant has the potential to generate O2-\ and hence chemiluminescence, in the presence of luminol, including ferricya-nide, persulfate, hypochlorite, ONOO-, and xanthine oxidase (Fig. 14.4a). H2O2 lies upstream of O2- in the reaction scheme depicted in Fig. 14.4a and its involvement in the initial oxidation of luminol partly accounts for the inhibitory effects of catalase (Fig. 14.4b). In addition, H2O2 will also react directly with the azaquinone (L+) and thereby contribute to the formation of excited aminophthalic acid, the chemiluminescent species  . 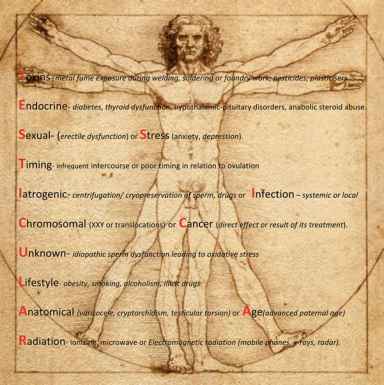 In some species (rat and mouse but not human), secondary radical species are created in the presence spermatozoa and luminol/peroxidase that generate very intense chemiluminescent signals over prolonged periods of time. These responses may reflect the nonenzymatic generation of NO and ONOO as a consequence of H2O2-mediated attacks on arginine . One of the most important points to emphasize about Fig. 14.4 is the opportunity this chemiluminescence detection system presents for redox cycling. All that is needed is a source of H2 O2 (or alternative oxidizing species) to initiate the one-electron oxidation of luminol, and an azaquinone reductase, such as diaphorase, to reduce L+ back to the parent luminol (L). The remaining elements of the chemiluminescent cascade can be generated by the detection system itself (O2- by the interaction of L* with ground state oxygen, H.O2 by the SOD-induced dismutation of O2-\ L+ by the dismutation of L*). While the scheme presented in Fig. 14.4a is a major simplification of the chemistry involved in luminol-dependent chemiluminescence, from a diagnostic andrology point of view there are several points to emerge from this analysis that should be emphasized: (1) the redox cycling activity characteristic of this probe will lead to a significant amplification of the signal and may explain why alternative methods for measuring H2 O2 have failed to detect this oxidant in purified suspensions of human spermatozoa, even though such activity has been clearly established in other species; (2) the complexity of this redox chemistry is such that we cannot state with certainty what is being measured with the luminol assay, it is certainly not just H+O2 ; (3) in particular, luminol assays may be measuring redox activity characterized by the cellular generation of oxidizing species capable of creating U; (4) notwithstanding the reservations that might be expressed concerning the specificity of this probe, the luminol assay is robust and generates results that are highly correlated with sperm function (see below). 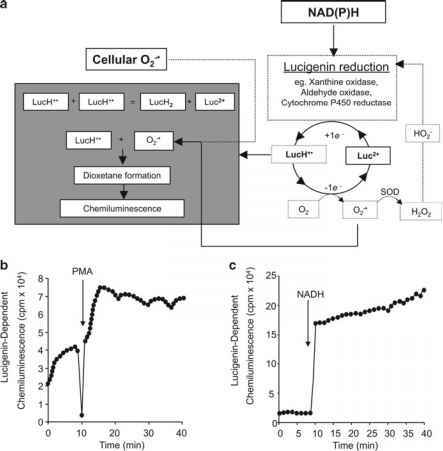 This probe is thought to be sensitive to the cellular generation of O2- largely because of the ability of SOD to suppress lucigenin-dependent cellular signals . However, the reservations that apply to the use of luminol to detect specific ROS also apply to lucigenin. In the case of lucigenin, activation of the probe requires a one-electron reduction, rather than the one-electron oxidation associated with luminol-dependent chemiluminescence . This one-electron reduction creates a radical (LucH+0 from lucigenin (Luc2+) that rapidly gives up its electron to ground state oxygen to create O2- and return the lucigenin to its parent state (Fig. 14.5). The LucH+^ generated from the one-electron reduction of lucigenin then combines with O2- to produce the dioxetane (Fig. 14.5), which in turn decomposes with the generation of light (chemiluminescence). The O2- involved in the last reaction could come from an independent cellular source, such as an NADPH oxidase, in which case the chemiluminescence recorded would reflect the generation of O2-\ as originally proposed for both leukocytes  and spermatozoa [32, 39] . However, an unknown proportion of the O2- involved in this reaction is an artifact created by the reaction between LucH+^ and ground state oxygen. Chemiluminescence created by the cellular generation of O2- or the redox cycling of lucigenin cannot be readily distinguished, since both sources of ROS are suppressible by SOD. When an agonist such as PMA (12-myristate, 13-acetate phorbol ester) is used to stimulate chemilumines-cence through the activation of protein kinase C, then it is probable that the cellular production of O2- is being measured (Fig. 14.5b). However, when chemiluminescence is generated by the addition of NAD(P)H, then the system may also be detecting the presence of any oxidoreductase capable of effecting the one-electron reduction of lucigenin . In the case of spermatozoa, we have clearly demonstrated that lucigenin chemiluminescence in the presence of NADH or NADPH does not represent O2- production, but rather the respective abilities of cytochrome b5 reductase and cytochrome P450 reductase to reduce Luc2+ to LucH+^ and artificially trigger a redox cycle that generates O2- as a by-product [41, 42]. Notwithstanding the deficiencies in lucigenin as a probe for evaluating O2- production, it does have value as a nonspecific redox marker for the enhanced electron transfer activity associated with defective sperm function . In many ways, the sensitivity and diagnostic value of the probe is enhanced by its redox cycling activity, rather than diminished. If specific quantification of O2- production is required, then there are alternative chemiluminescent probes that do not redox cycle including the Cypridina luciferin analog, MCLA , and coelenterazine .